Since my nephews are getting older, I have a feeling they are going to be more and more difficult to keep busy like this. I mean, how many Perler bead race cars can you make before you are totally over it? 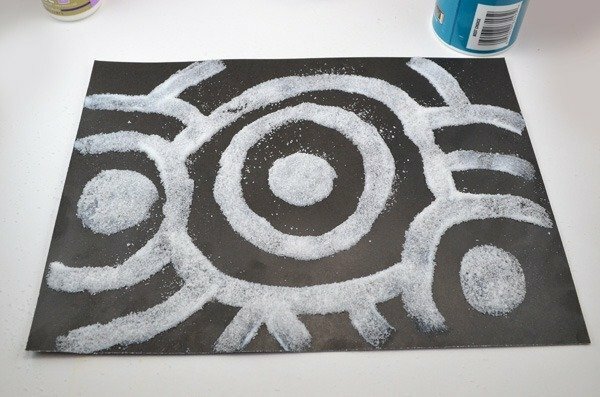 In looking for some fun kid crafts I stumbled upon salt painting. The idea is so basic and simple and I think the boys will wig for it. But guess what I didn’t expect? That I’d have a ton of fun doing it myself! For reals! 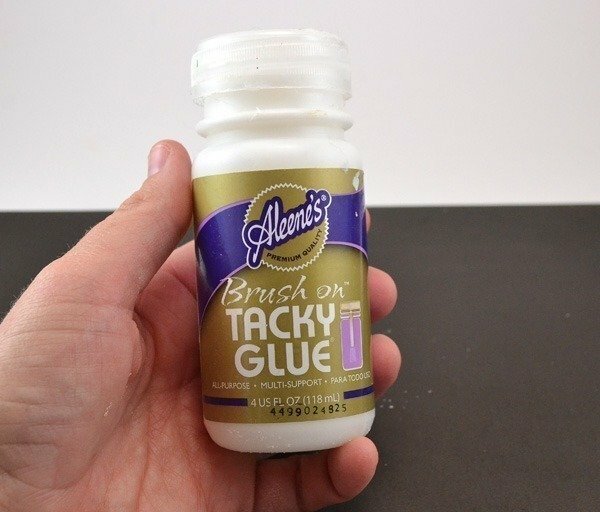 For the star of this show I decided to use Aleene’s Brush on Tacky Glue since it already has a brush ready to rock inside. If you want finer lines you can always use any tacky glue formula you choose with a cheapie brush. 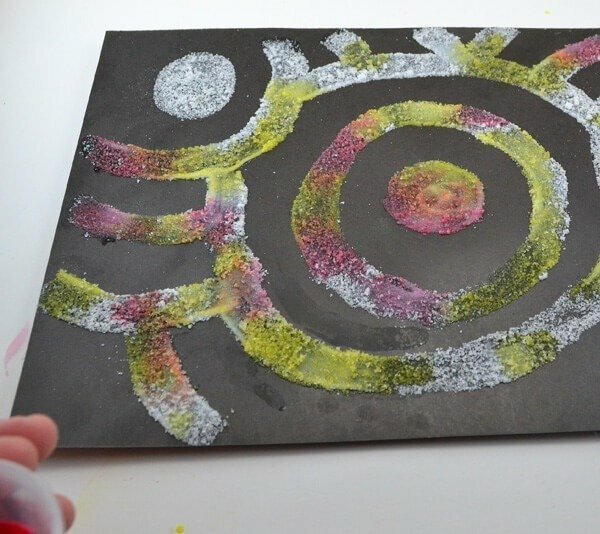 Take your glue and draw out shapes or a pattern or picture. 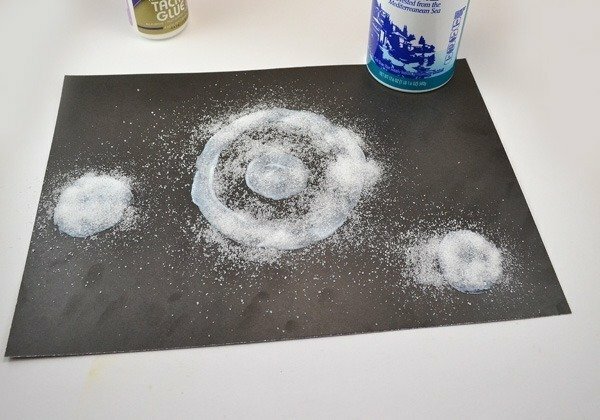 Work a little at a time so that the glue remains wet and sprinkle with sea salt. Shake the excess off and keep on going. 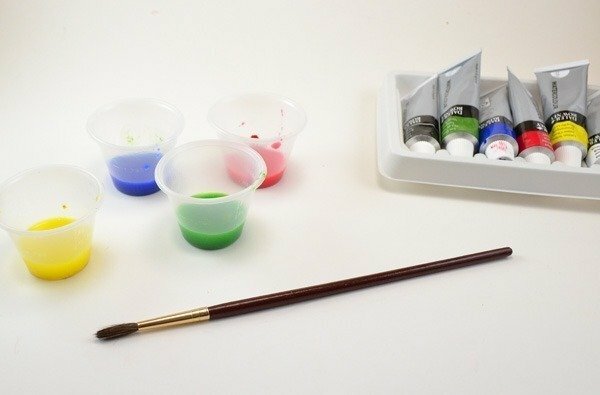 Take your tube watercolors and add some water in little cups. These plastic cups are for measuring medicine and are sold on Amazon. They’re cheap, cleanable therefore reusable and have convenient markings for when you need to use with resin or other crafts where measurements matter. 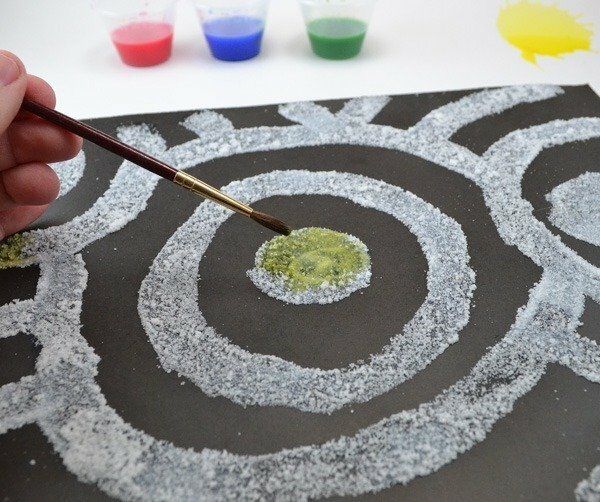 Load your brush with some of the watery paint and either allow the paint to drop from the brush or just barely touch the brush to the salt. The color will take off and spread! You can go around with different colors as you please. 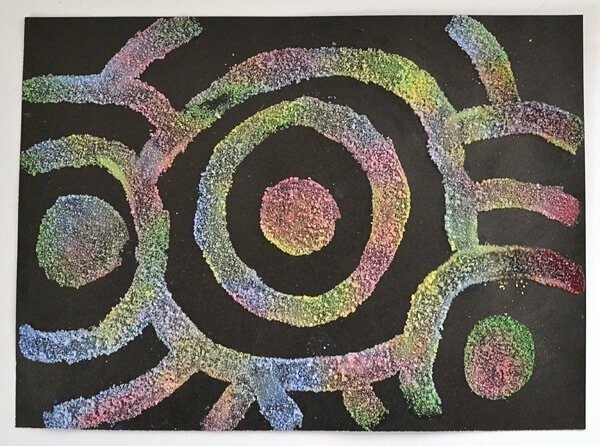 The closer you place colors the more they blend and make other colors. You can even directly place one color on top of another to make others i.e. yellow and blue make green. 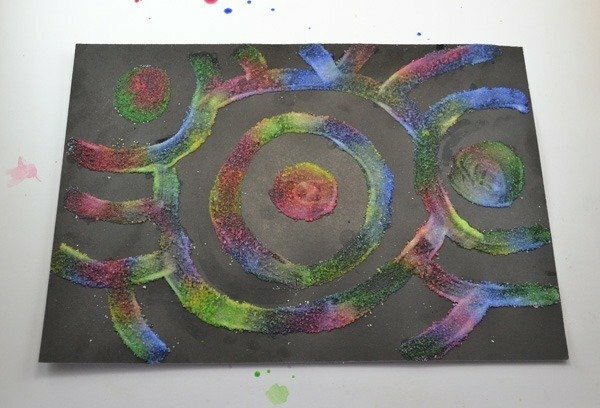 Note the colors will dry far more pastel than what you see. 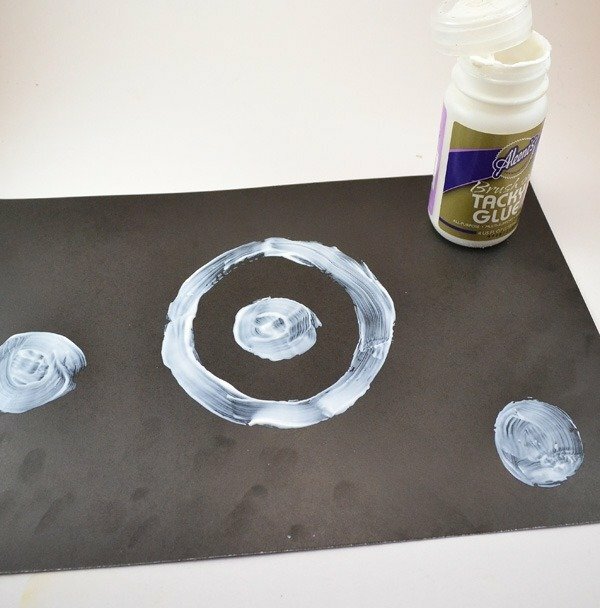 Make your colors more saturated with paint if you want darker colors. 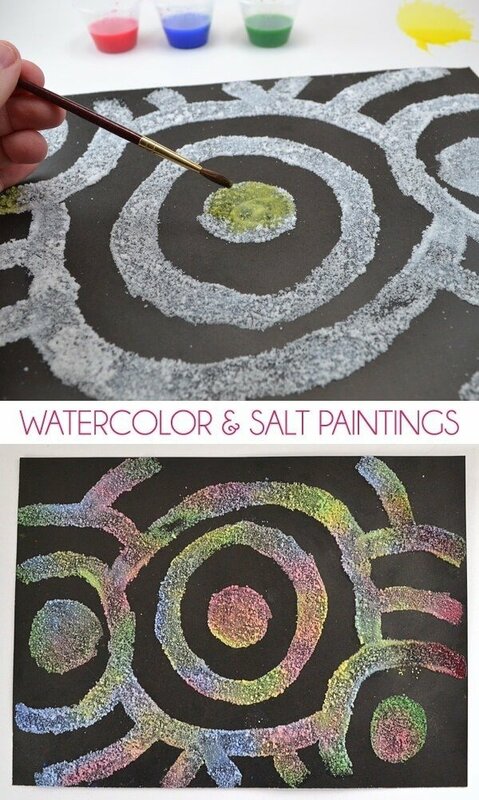 Allow your painting to fully dry and give it a tap when it has to remove any excess salt. And that, my friends is all there is to that! 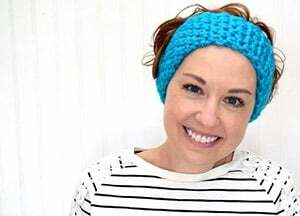 If you’re kind of crafty it is very possible that you already have these things on hand so it’s a great snowed in or rainy day activity! How did you get all the salt off? I notice little bits of salt here and there on the “after” picture. The only way I could think to completely de-salt the project is to hang it up outside and brush it off with a cheap chip brush. It looks great and I’ve used a little Kosher salt with watercolor and silk dye, but never as much as you need for this one. I suspect I’ve complicated the salt removal thing. Please tell me how simple it is! Those are just loose pieces that are coming off. 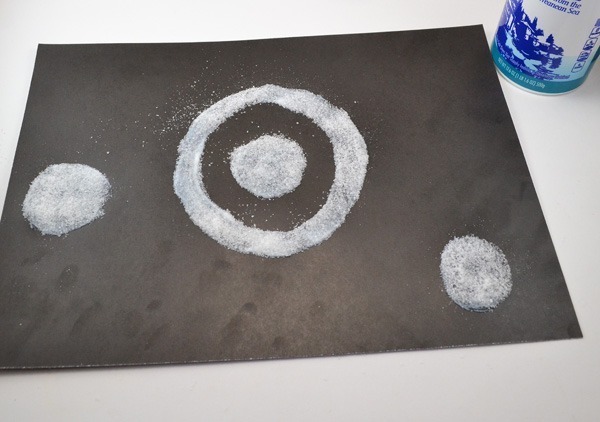 If you shake it pretty clean and then seal it with, say, an acrylic spray sealer, you shouldn’t have that problem. What is the black pepper for? It’s listed in the ingredients. It says black paper, not pepper. Is that poster board, construction paper or lack watercolor paper?